Congregation Beth Israel was formed August 2, 1932 as a Conservative synagogue in cooperation with United Synagogue of America. It was first housed in the then existing Jewish Community Centre at 11th and Oak Street. Services were held there from 1932 to 1948. Mr. Nathan Bell was the first President of the Congregation, Mrs. Etta Koenisberg the first Sisterhood President. Rabbi Benzion Bokser was hired September 1, 1932 as the Congregation’s first Rabbi. The School was established in 1933, and the choir was formed shortly thereafter. As the Congregation grew, it required more space, especially for High Holyday series, bar mitzvahs, and weddings. A building fund was established in 1937. Land at the present site was purchased in 1944 and consecrated in 1946. The first High Holyday services were held in the present sanctuary in 1948 and the synagogue dedication was held September 11, 1949. In 1945 the cemetery grounds were purchased. In 1965 Congregation Beth Israel’s constitution was amended to give women membership and voting rights with two women elected to the Board of Directors. The role of women’s participation was first raised in 1969, while the issue of aliyot for women began in the early 1980’s, gained momentum after Yom Kippur 1986 and settled in its present form in 1995. Today women are full participants at all services and in all roles. Today the mission of Congregation Beth Israel, member of the United Synagogue of Conservative Judaism, is dedicated to the strengthening of all aspects of Jewish life, including worship and Torah study, religious, educational and social activities for all ages, and the observance of life cycle events. •	In 1970 the Groberman Chapel was renovated and refurnished. •	In 1982 the Koch Memorial Chapel at the Beth Israel Cemetery was dedicated. •	In 1992 the Beth Israel Cemetery Refurbishment project was completed. •	In 1993 the renovation of the entire synagogue was completed. •	2007 was the 75th anniversary. •	2012 was the 80th anniversary. •	In 2012 a major renovation and expansion was undertaken which was completed in 2014. For a more in-depth history on Beth Israel, please see the "Beth Israel 80th Anniversary History Presentation", written by Yale M. Chernoff December 15, 2012. 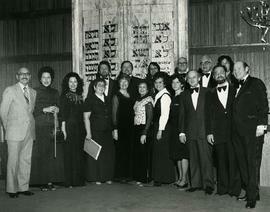 The fonds consists of administrative and operational records generated by Congregation Beth Israel including: textual records; photographs; moving images; and scrapbooks. 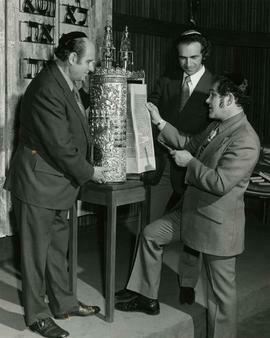 The fonds is arranged into 18 series: Bar/Bat Mitzvahs; Weddings and marriages; Jewish Divorce (Get); Deaths and cemetery; Ritual Committee; Publications; Financial Statements; Birth (brit milah and baby naming); Conversions; Beth Israel – Schools; 75th Anniversary; Staff administration; Building: Renovation, maintenance and construction; High Holidays; Congregation Beth Israel Board of Directors; Synagogue administration; Beth Israel Women’s League / Sisterhood; and Photographs, audio-visual and scrapbooks.